She shyly a burst forth in a beautiful straight pearly white smile the envy of any orthodontist. He put the books back on the shelf and they debated whether she should guerilla sign all the copies. Mostly he talked and she responded in body language. We swapped spaces on the aisle. 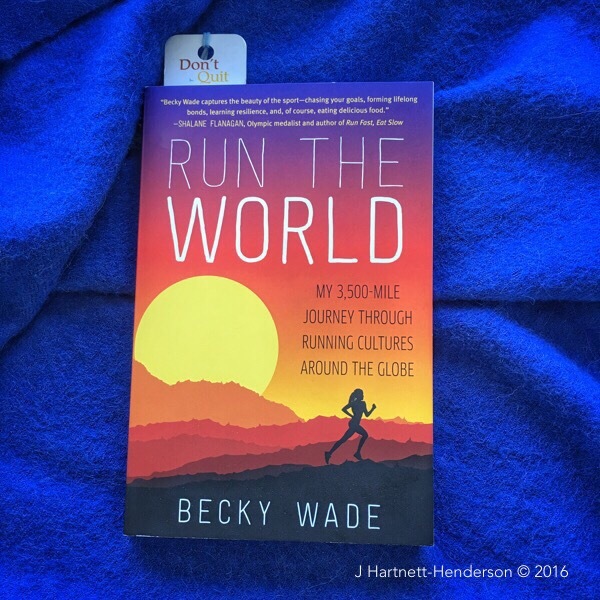 I picked one of the books up – Run the World – My 3500 Mile Journey Through Running Cultures Around the Globe. I recalled my serendipitous 7K race in Barcelona. I loved seeing the city on closed streets and I loved how different they raced there. No bathrooms at the start. We got to run through the Olympic stadium over a springy newly installed track surface which made the piece of the old rock hard olympic track souvenir for participating much more than something for the dump. The tall man responded, “It’s hot off the press. Only been out for 3 days.” I mentally flagged that he was using one of Cialdini’s seven influencing patterns to help the sale. Moments later 3 more people joined the pair in the aisle. I flipped to the table of contents. Chapter 2: Kitting Up and Forging Ahead / Greater England and Ireland / 283 miles. Japan, Switzerland, Ethiopia, Australia and New Zealand and Sweden and Finland rounded out the roster all totaling 3500 miles. So many different places to see and run. So many running cultures to explore. I was hooked. I turned to the group, looked at her tiny self and said, “I’ll buy a copy.” All 5 people turned toward me and in unison said, “Thank you!” Becky Wade, your peeps are awesome! What I learned later is that Becky had just been through a steeplechase track ordeal. Denied the right to compete at the trails at the last minute because her qualifying race was run on a track that didn’t have a rail, she had attempted to qualify in another race, not reached the qualifying time, appealed the ruling twice, been denied and then found out at the last minute by accident on the Olympic site that she had been admitted. By the time I saw her, she had cancelled and rebooked travel plans, made it to the Trials, raced and not placed. All the more reasons that signs of a successful book launch would have been encouraging. And the book is fantastic! I read it in 2 days. It’s a dense page-turner chock a block with facts about places, people, cultures, races and new found friends. Becky is a fabulous non-fiction writer, a kind person, a cross-disciplined thinker and an inspiration! And her pre-race play list in the back contains wonderful discoveries in a world where hits from the 80s seem to prevail in public places. I highly recommend!